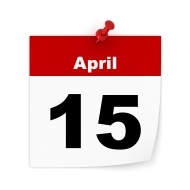 Is April 15 the Tax Filing Deadline this Year? April 15 Deadline is Adjusted to April 18 !! This year’s individual tax returns are due April 18, as Saturday, April 16, 2016, is Emancipation Day in the District of Columbia, and the holiday is observed on Friday, April 15. However, because Patriot’s Day will be observed on April 18 in Maine and Massachusetts, residents of those states will have until April 19 to file and pay their taxes. This also means that by statute you have until April 18 to amend a 2012 return to claim a refund. A nonresident alien completing a Form 1040-NR generally needs to file by June 15. However, nonresident aliens who have wages paid in the United States or receive non-employee compensation in the United States need to file by April 18. If you’ve recently become the target of an IRS criminal investigation or are facing other tax liability, contact tax attorney Jeffrey Anton Collins as soon as possible!